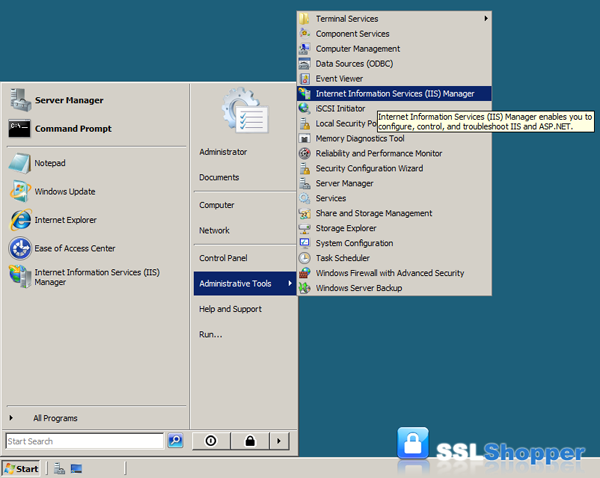 This article will walk you through the process of ordering an SSL certificate from a commercial certificate authority and installing it on an IIS 7 Windows Server 2008 machine. The process will also work for later versions such as Windows Server 2016 and IIS 8 and IIS 10 with some small modifications. 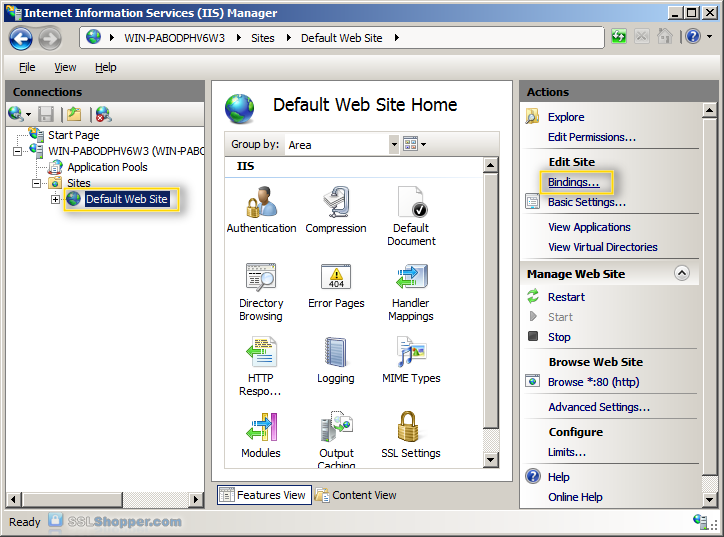 Click on the Start menu, go to Administrative Tools, and click on Internet Information Services (IIS) Manager. Click on the name of the server in the Connections column on the left. 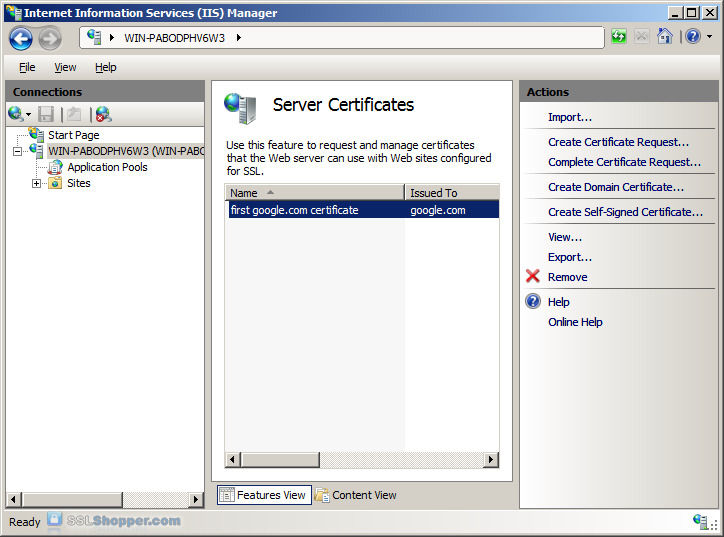 Double-click on Server Certificates. Enter all of the following information about your company and the domain you are securing and then click Next. Common Name The fully qualified domain name (FQDN) of your server. This must match exactly what you type in your web browser or you will receive a name mismatch error. Organization The legal name of your organization. This should not be abbreviated and should include suffixes such as Inc, Corp, or LLC. Google Inc.
Leave the default Cryptographic Service Provider. Increase the Bit length to 2048 bit or higher. Click Next. Click the button with the three dots and enter a location and filename where you want to save the CSR file. Click Finish. Once you have generated a CSR you can use it to order the certificate from a certificate authority. If you don't already have a favorite, you can compare SSL features from each provider using our SSL Wizard or by comparing cheap SSL certificates, Wildcard Certificates, or EV certificates. 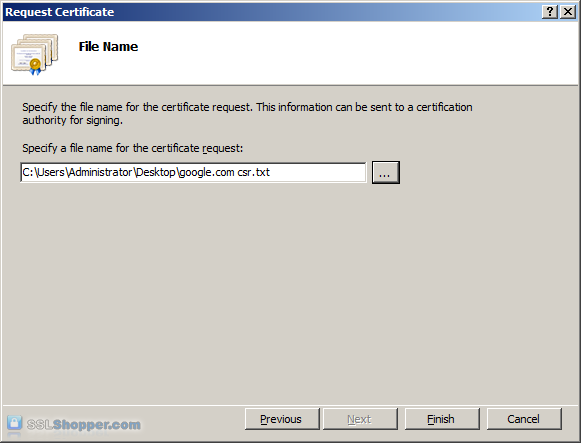 Once you paste the contents of the CSR and complete the ordering process, your order is validated, and you will receive the SSL certificate file. Click the button with the three dots and select the server certificate that you received from the certificate authority. 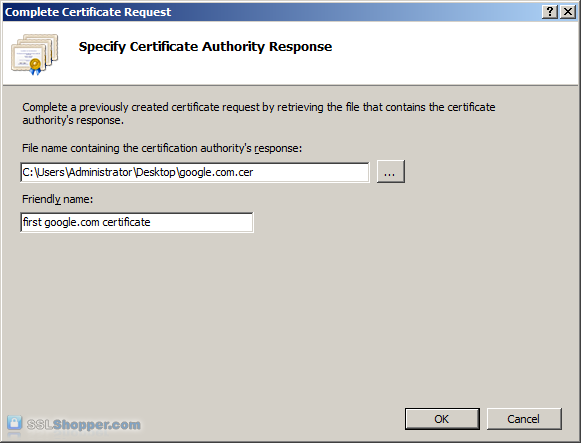 If the certificate doesn't have a .cer file extension, select to view all types. 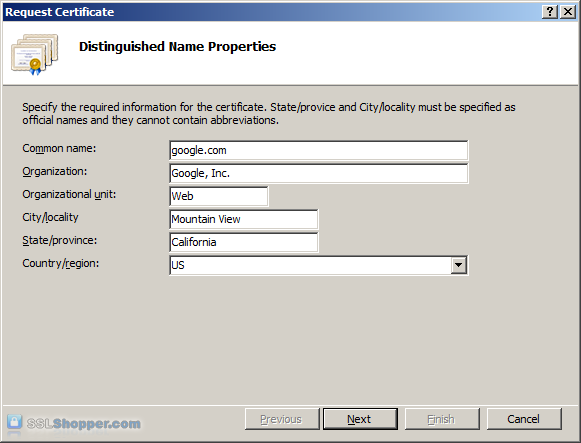 Enter any friendly name you want so you can keep track of the certificate on this server. Click OK. 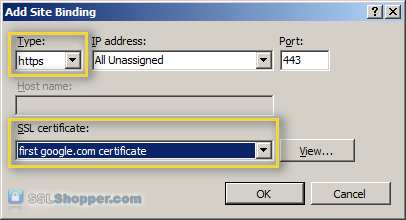 If successful, you will see your newly installed certificate in the list. If you receive an error stating that the request or private key cannot be found, make sure you are using the correct certificate and that you are installing it to the same server that you generated the CSR on. If you are sure of those two things, you may just need to create a new Certificate Request and reissue/replace the certificate. Contact your certificate authority if you have problems with this. 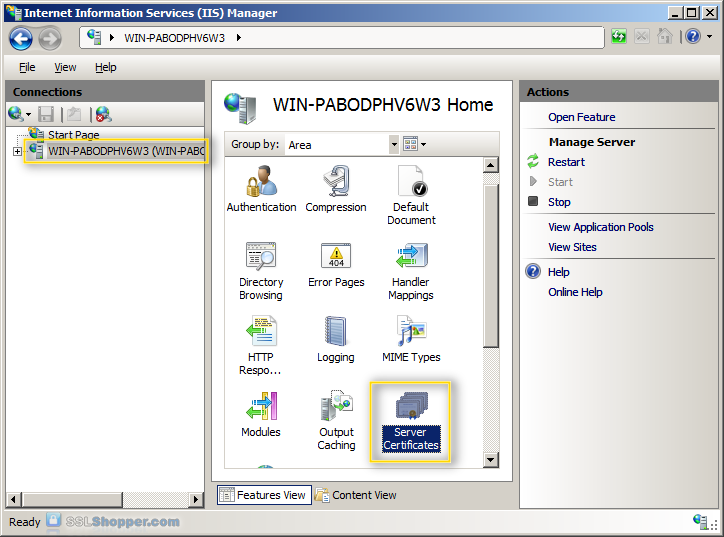 In the Connections column on the left, expand the sites folder and click on the website that you want to bind the certificate to. Click on Bindings...in the right column. Change the Type to https and then select the SSL certificate that you just installed. 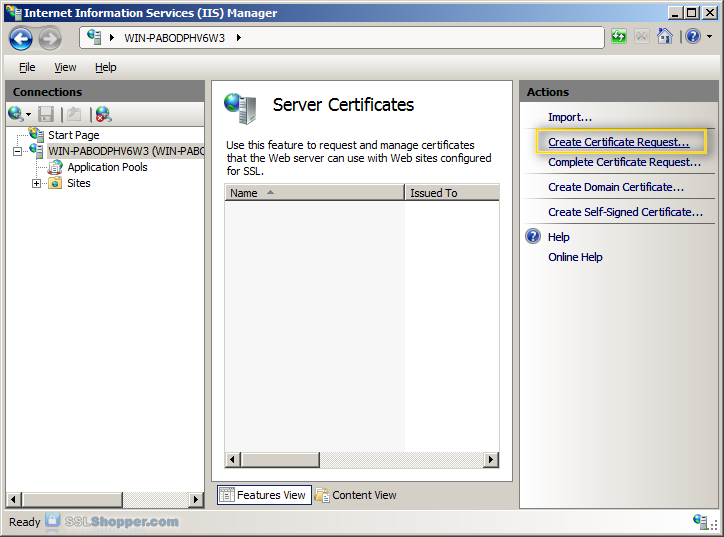 Click OK.
You may need to restart IIS so that it starts giving out the new certificate. You can verify that the certificate is installed correctly by visiting the site in your web browser using https instead of http or using our SSL Checker.